What's the general feeling about closing Newcomen Street to traffic? to become part of Boris' cycle highway. Crosby Row will become the only and sole access to Guy’s Hospital including the new Cancer Centre. Crosby Row will become two-way with all the chaos and gridlock we experienced before (going back a few years), only worse. It’s simply too narrow. There has never been a public consultation on the plans (it was not included in the cycle way, but part of the plans for the hospital) and we are feeling utterly frustrated and ignored. There isn't much traffic in and out of the hospital. I'd only ban traffic over a certain size. As someone who walks down there twice a day, I really don't need lorries trying to get through with tyres on the pavement on both sides. Isn't Newcomen Street currently one-way westbound away from the hospital? And Crosby Row is one-way southbound, away from the hospital. So closing Newcomen Street in itself doesn't require Crosby Row to reopen towards the hospital. Presumably it's changes in Snowsfields that require that? But it seem extraordinary there's been no public consultation. I use Newcomen Street all the time when driving, but it's really as a shortcut. We can cope with Newcomen Street closed and the traffic should still moveok. In fact there will probably be less traffic in those side streets, as only those driving to the hospital or locals/deliveries will use it once Newcomen Street is closed. More consultation should have happened though. This is a TFL proposal, to which I objected. Separately, but connected, is a Southwark Council proposal to make the rest of Newcomen Street two-way, with Crosby Row reinstated as two-way. Crosby Row was temporarily one-way whilst construction of the cancer centre took place. I also objected to this proposal, citing in part the lack of information provided, and the limited consultation with local residents. I think this is a brilliant plan. 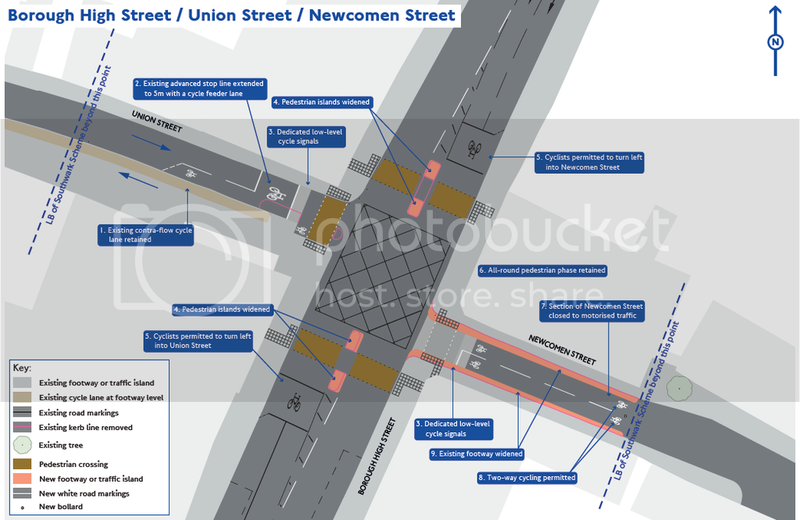 I use Newcomen street daily on a cycle. At present its a horrid road, full of diesel-belching lorries, vans and taxis all rat running to avoid the Borough/Dover st/Long Lane junction. Cyclists and pedestrians have to dodge big lorries mounting the pavement. Really awful, especially as it forms part of the existing cycle quiet route from Bermondsey to Waterloo via Union St and the Cut. I've always thought, this is a narrow road it should be cycle and pedestrian only. As for the other end and Crosby Row, there is really very little traffic going into Guy's hospital. The odd taxi and a couple of light vans. All the deliveries go in the back via St Thomas St.
All in all there will be a huge improvement in environment, air quality and safety across the whole area. Great input, thank you everyone, especially Peter. Interesting to hear your views on the current rat-run. Thanks Brendan, yes it would put a stop to that which is good. The problem we have is a simple one; Crosby Row is too narrow for two-way traffic. I have to say, there's huge amount of traffic as it's a major London hospital. There's also the half-hourly Guy's shuttle bus that runs all day from 7:30am until about 6 or 7 in the evening. Also Crosby Row is used as a car park for Private Ambulances and cars with parking dispensations. I agree wholeheartedly on the lack of public consultation. Absolutely nothing on plans for Snowsfields, Crosby Row, or the surrounding local street network. Back in the day, prior to work starting on the verdammt Shard, I, and no doubt every black cab driver familiar with the area, would use Snowsfields as an escape route from clogged up Tooley Street, or sometimes St. Thomas Street. If I picked up a job in e.g. Jamaica Road, going West, I'd initially try for Tooley Street via Bermondsey Street. If Bermondsey Street was backed up because traffic was blocked from getting into Tooley Street opposite More London, I'd carry on along St. Thomas street, or swing into Snowsfields, then into Newcomen Street, then right into BHS. If Newcomen was held up, I'd make a right into Great Maze Pond, then left into St. Thomas Street. Occasionally, a jobsworth at the entrance to Great Maze Pond would ask where I was going, I'd say, "A & E", or if I was empty, "Picking up in A & E."
Sometimes, going west along Long Lane, you'd run into a wall of traffic fighting to get out into Great Dover Street. I'd swing into Tennis Street, go left into narrow Angel Place, to BHS. When that eventually got blocked by a a metal stanchion, you had to take a chance on Newcomen Street, if that's now going to be taken out of the equation, stand by for a slew of non moving traffic in the area. Man, did I ever do the right thing, giving up taxi driving! Put every road back as it used to be Tom. seems all the road planning in the world makes it a nightmare for road users. Do you remembers Tom before the closure of A&E the Hospital had a lovely back entrance for Ambulances in snowsfields, ensuring traffic only went into gt.maze pond for patients and essential deliveries. So no chaotic parking at the entrance of hospital just cars and ambulances . This closed many years before new construction of cancer centre.